Intensifying human exploitation is pushing the world’s oceans to the limits of their ecological carrying capacity. More than 75 percent of world fish stocks are already fully exploited, overexploited, depleted or recovering from depletion. The situation is even more critical for some highly migratory species that are exploited solely or partly in the high seas. 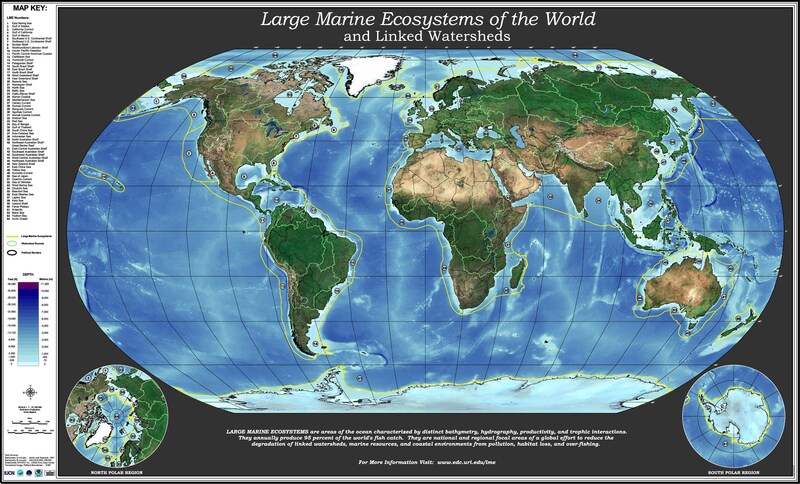 Globally, the world’s oceans have been divided into 66 large marine ecosystems (LMEs). These are defined as near coastal areas where primary productivity is generally higher than in open ocean areas. To date, the GEF has supported sustainable governance of 23 LMEs in which multiple countries collaborate on strategic, long-term ocean governance of transboundary resources. Stepping up action on the ground and aiming at increased impact at scale, the GEF will continue to focus its investments in supporting the management of LMEs. By doing so, we will support priority actions and investments within regional policy frameworks. This process is helping countries move toward sustainable development, unlocking the potential for the Blue Economy, including blue carbon restoration, marine spatial planning and economic valuation. The large marine ecosystems around the South China Sea and the adjacent Gulf of Thailand include global centers of shallow marine biological diversity that support one of the world’s largest fisheries. Through a GEF-funded project, seven countries came together to address the degradation of coastal habitats, the overexploitation of fisheries and land-based pollution. This project demonstrated that collective management is possible even when border disputes exist over access to oil, gas and fisheries. Among its results, the project developed a list of 52 known spawning and nursery areas that represent a system of Fish Refugia for the South China Sea and its adjacent gulf.